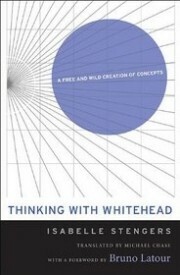 Isabelle Stengers’s Thinking With Whitehead arrived in the mail today. The publication of the English translation of this tome, a long nine years after the French original, is a genuine Event in the world of process-relational philosophy (or whatever you’d like to name the “beatnik brotherhood,” as Harman calls it, of philosophers of immanence and becoming — a brother/sisterhood that Harman asserts does not constitute a counter-current to the hegemonic alliance of philosophies of essence, substance, and onto-theological transcendence, but that Deleuzians and others would like to think does). Nothing wrong with your post at all, Adrian – I say we reopen the debate! My copy just shipped the other day, should be here any time now. I’ve been really looking forward to this one as well. Looking forward to the conversations! Thanks for the heads up. I just ordered my copy with next day shipping. I realize you’re just having fun, but I realize you wouldn’t set up oppositions between objects and processes like this. In the case of my work, at least, I don’t see the two terms opposed. In my view, object thinking is absolutely crucial for thinking ecologically. It is not object thinking that is to be opposed, but rather the hegemony of subject thinking which deeply occludes the manner in which we’re amongst things and how these things are perpetually acting. on May 24, 2011 at 1:08 pm | Reply The Movement of Things « Larval Subjects . Does your copy appear to be POD? Mine does, and I’m a little startled by the fact that Harvard UP might be doing POD on first run hardcovers. row pews to the choir stand, where it previously had been banned. the most popular of all the music categories. And additionally, i am simply perpetually amazed regarding the superb things offered from you. Some four facts following this web site square measure undeniably the absolute best I’ve had.